My first proper trail race. And it had to be a real muddy one! In truth it’s probably had worse years. The weather turned out not bad at all, even a little hot at times, which is more than can be said about today and the snow outside. 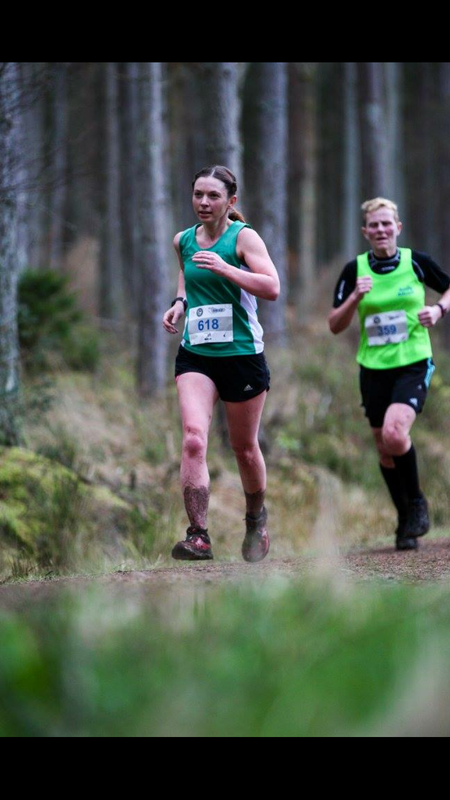 Carnegie Harriers host the Devilla Forest 15km in a place called Tulliallan which is also where the police training is carried out. No significant relevance – just saying. In true Webley style we left late so missed the car share but did manage to get there in good time. Registration was easy but I found that many people in one room too much and quickly escaped back to the car – I guess I still need to work on some things. I did manage to pick up my complimentary beer though. So that’s progress! I saw a few from the roadrunners so headed over to say hi and for the team photo. (I’m not going to lie, I love a team photo! I’m sure that doesn’t shock anyone though ha ha). 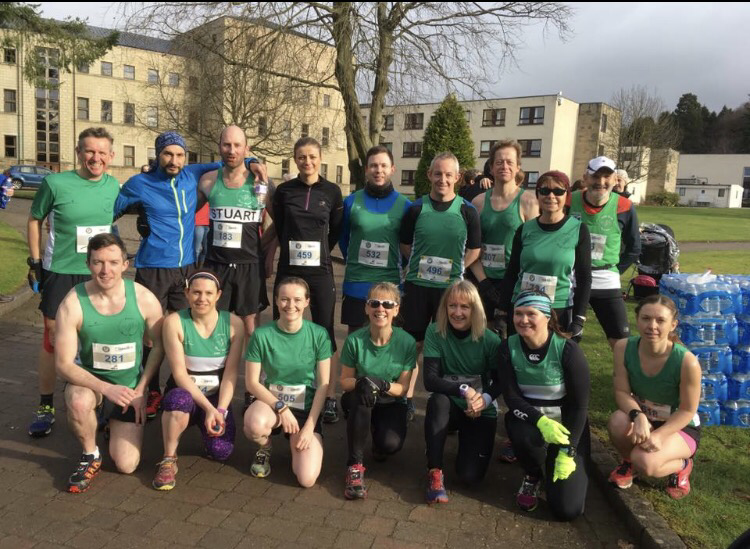 Standard announcements were done – this is a trail race, it’s on some rough ground, don’t expect tar mac, this is the 15km race so if you’re signed up for the 5km you’re in the wrong place (which one poor lady was and went scurrying away, hey. we’ve all done it). Then we were off. A bit of an uphill to start and a zig zag and I quickly saw I had started a lot further back than intended. Not to worry though. I knew I wasn’t going to be making fabulous time. Another roadrunner went past me and I decided to keep her in my sights at least. She had gone past me last minute at Path Of Condie so I wondered if I could ‘repay the favour’. Very quickly we hit the first mud bit and I was transported back to Tough Mudder. Hmm, not really what I look for in a run, but I will give it a go. My neon pink trainers turned a dashing shade of em, well, brown. Second mud section and to my surprise the people in front of me just stopped. Hadn’t expected this. 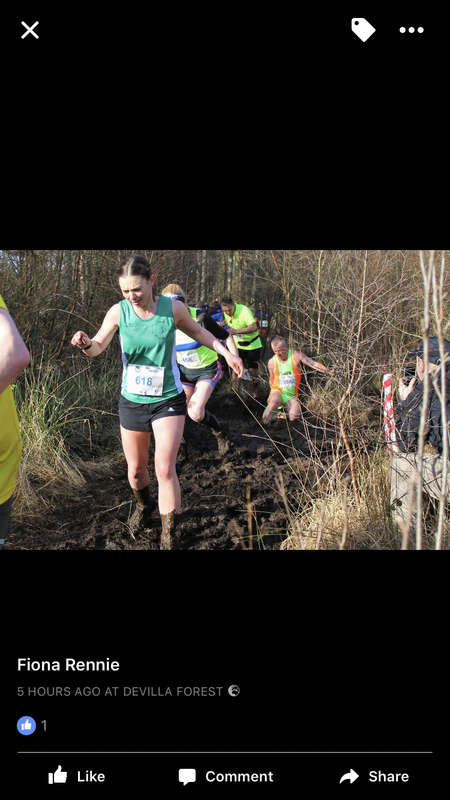 I wasn’t exactly amongst the elite of the race but I didn’t expect people to actually try and dodge the mud. A runner over took us shouting ‘it’s only mud’. It soon became quite congested and elbows were needed. I may be small and not incredibly fast but I can hold my own and won’t be pushed to the side thank you. Especially when the side means falling on your rear and ending up with a mud mask ha ha. By now the mud was layered half way up my legs (it was only ankle deep on normal sized people) and it felt like I was carrying an extra person. My target was out of view but I was concentrating on trying to stay upright and not slide backwards with every step forward. Running round the Loch side was difficult as it was all twists and turns and slippy tree roots but I didn’t come a cropper. That wasn’t until just before the plank bridge when somehow I managed to run right off the path and straight in to the bush. Picture a drunk person walking home and that was me. I had no fear going over the single plank after my intimate moment with the bush as all I wanted to do was get away. At least I gave the marshalls a good comedy moment! ‘I like to be at one with nature’ I believe was my passing comment. Not far after the incident with the bush was the 10km sign. 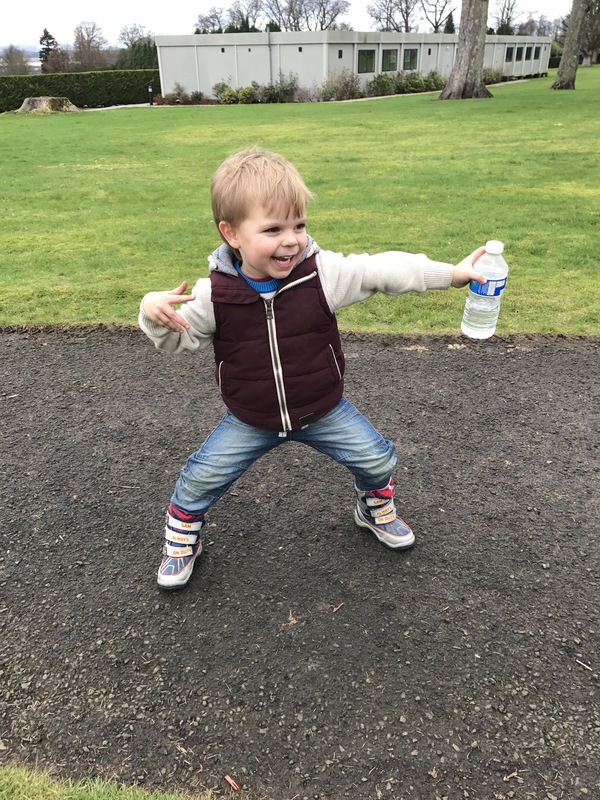 Now, I was running along seriously debating to myself whether or not you can get pregnant by a bush and if you could what the baby would look like when I heard to my left, in the strongest of Scottish accents, ‘You’re f@cking @rse that’s 10km!’. Dad??? Is that you running beside me?? Took me all levels of self control not to burst out in laughter. Of course it wasn’t my dad, and it wasn’t only 10km, but that was definitely another comedy gold moment for me! I love that about running races. The random out bursts that never fail to keep me going. Love it. Just in the distance I could see my ‘target’ again. She wasn’t too far away! I could possibly catch up with her. So I tried to kick it up a little. Pushed up the hill then let gravity pull me down it (I love a good down hill!). The track folded back on itself and by this point she was only about 100m in front. Round the corner I went and…. It was up hill again. I will just ‘let’ her go I said to myself. Nothing at all to do with the fact she’s actually faster than me. Nope. Nothing at all. Near the finish and I’m thinking all is good. I’m not in the mood to push the last bit knowing I have a cycle session later that day so I stay steady. But, naturally, someone behind me speeds up, and goes past me. My legs are sore as it is. I’ve got 30 miles on a bike to do later. A shake of the head and I push in to a sprint, catching her right on the finish line. The race is chip timed so instantly I’m wondering if she started before or after me. (When did I get so competitive?!?). My youngest joins me at the line and comes through the tent with me to get my chip timer cut off. Those poor people having to touch the mess I’ve brought back with me! Luckily they had gloves but getting that close to some people’s feet after a race? I would want a nose peg – and that’s just for my own feet ha ha. As it’s at the police training place there were showers (ah, appears my earlier comment WAS relevant) so I headed over after a couple of ‘check the mess I’m in’ pictures. I saw another roadrunner who had finished quite a bit before me in the bathroom. ‘There’s no toilet roll I’m afraid’ she tells me. Not to fear – ‘I’ve got tissues!’ I yell over my shoulder as I swiftly do an about turn and make my way back across the floor dodging all the ‘brown’ stains. Now I know that in all likely hood it was just mud we had brought in ourselves from the run but you really can’t get away from the fact it’s brown stuff, and it’s brown stuff on a toilet floor. Sorry. Tissues grabbed and it was straight back to the bathroom, I had been needing since the start of the race. Note to self, this is not the way to build up your pelvic floor. I’m actually beginning to wonder if it’s more ‘see a bush need to pee’ mentality going on – you know, like a dog marks its territory or a child has to use the toilet everywhere you go. Wait, did I just call myself a dog? All in all it was a great race. Something different, good weather, nice distance, great marshalls. What more could you want? Back home it was scrubbing brushes at the ready to get the mud off. I’m not talking the fairy soft kind. I had to go full iron wool bad boy to get the clumps off my legs! There was no mud dodging from me! But would I do it again? Definitely. (If only to see that bush again ha ha). 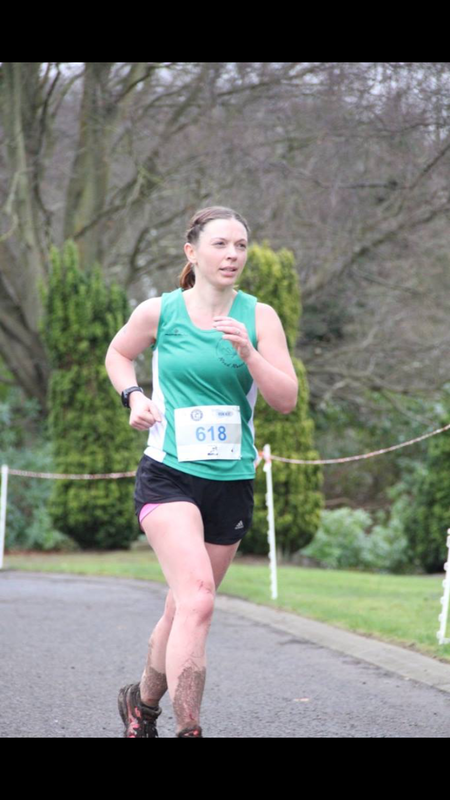 PHOTOS: Thanks to Carnegie Harriers, Steph Reid, Fiona Rennie and Ethan Lee for the fab photos, you guys did a great job! I don’t know what made me think I need to try even more new things this year – I mean, surely pushing my mind, body and soul through the ‘torture’ of a Half Ironman is enough isn’t it? Tomorrow I am participating in a 15km trail race. The word participating being hugely more accurate than running, racing or even perhaps walking (time will tell). I thought it was only 20 minutes drive away as well – turns out it’s an hour. I guess it’s never going to sink in that everywhere is NOT 20 minutes away. (Note to self – a refresher in geography might be a good idea. Might just file that thought away next to cooking lessons though). So what do I know? It’s going to be muddy. That’s a given. I’ve read last years run reports and one stated there was a little stream you need to cross that’s up to your knees. Now, as I’m knee height to a grasshopper I’m going to take arm bands and a rubber ring with me. 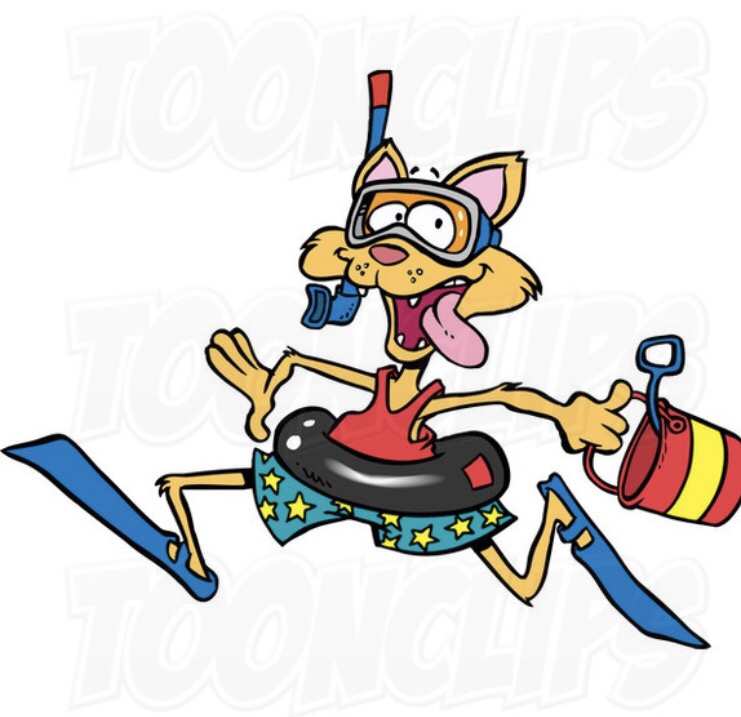 Possibly a wet suit too. Just in case. No umbrella though as I don’t think it’s going to be torrential rain. 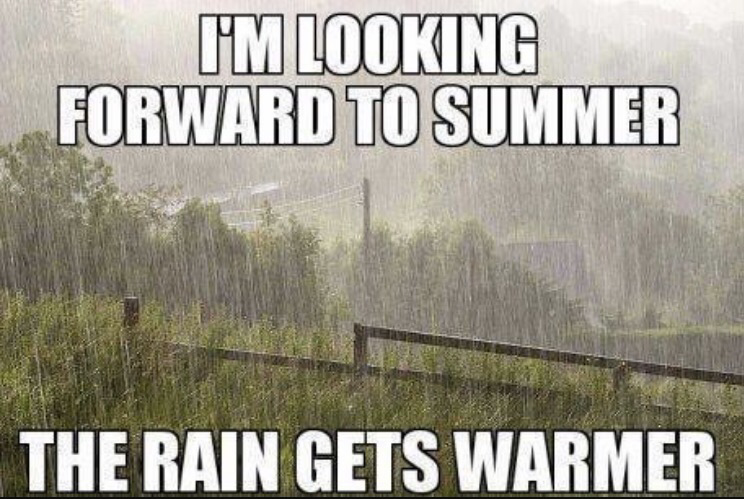 It might even be quite warm! Still taking a flask of tea though to warm up after. And speaking of afterwards….. I will have a turbo session I need to do to keep up with the Half Ironman training. I’m sure that will be fun! There’s a 1 hour cut off for 7km and for some reason that is playing on my mind. I don’t usually focus much on cut off times for running but I know this type of run is very different from the road. I’m pretty confident I should make that. If I don’t, something’s gone very wrong! There are quite a few from the roadrunners who are all going so I won’t be alone in my green vest. The other half is also coming along with the youngest (although I’m pretty damn sure he just wants a laugh!). 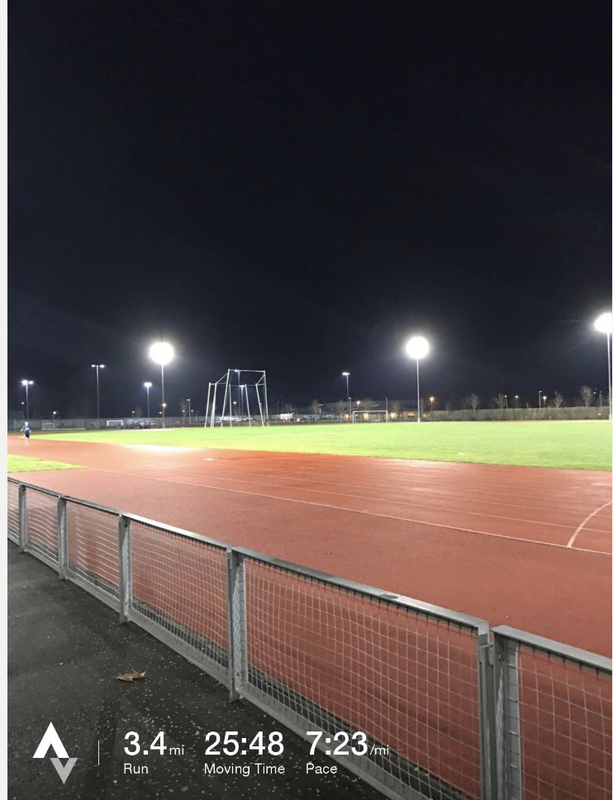 Thursdays have been track night for a little while now and although I haven’t routinely been going (as in I think I went once in December and then chickened out but I have been this year) I have started to enjoy it. Ok, that’s maybe stretching the truth just slightly. My pace is dropping off as I put more work in to swimming and cycling so it’s necessary now more than ever to work on speed. It’s this I’ve started to realise/had a good old hearty slap in the face with reality. 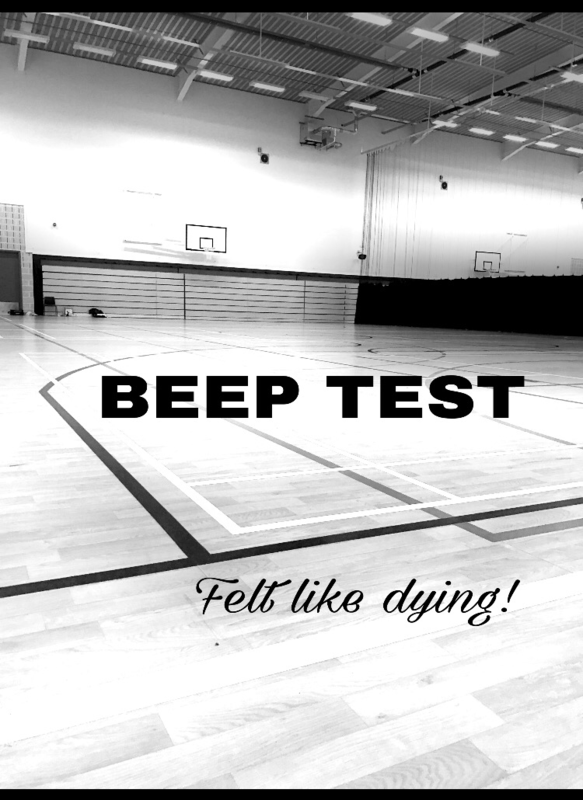 However, tonight was my first ever beep test. There’s been one or two things going on which have forced me to change up my training but the beep test was one thing I really wanted to do. That last statement alone proving I have never done one. The other half dropped me off and I walked in knowing I was running between 2 lines progressively getting faster. The only other thing I knew was the ‘pass’ rate for the police is 5.4. 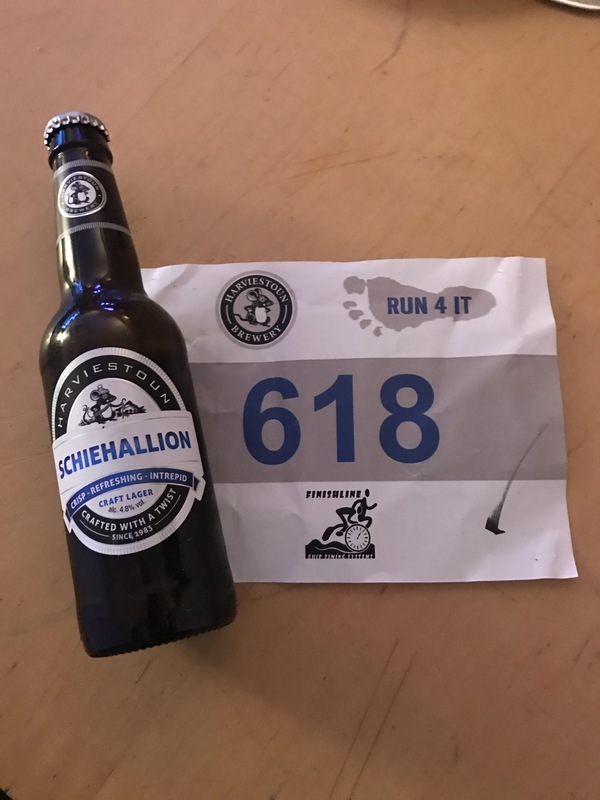 I was very uncomfortable not knowing what speed it started at, how often it sped up, how many sections in each level, what I should be aiming for – pretty sure I went white when I was told I was in the first group too and threw up in my mouth a little (can I class that as pre-race fuel?). Anyway, internal turmoil aside, there were 5 starter beeps and we were off. It started slow enough with a brief pause either end as I waited for the beep signalling to go again and yup, you guessed it, it announced when the next level was and surprise, surprise, it got faster! I found it hard though. I’m not afraid to admit that! I didn’t get as high as I had hoped, in fact, out of those who were there, I was very much at the bottom of the scale. However, it’s not a competition. I could use a number of excuses as to why I didn’t perhaps do as greatly as I had hoped but facts are facts at the end of day. I will admit I gave up far too soon but not sure if I could have went that much longer. Kevin was encouraging me but I used this as an excuse to stop (because ‘keep going’ and ‘stop’ obviously sound the same). When the last person in my group finished it was our turn to be adjudicators for the next group. Now because I’m almost always running in a race I don’t pay a great deal of attention to how others run. I reckon if I did that I would fall over, I need to stay focused on where I’m going – yet I still get lost. Watching the next group was quite fascinating. Everyone had their own style of run. Some used their arms, others didn’t. Some had very small steps others had long strides. No one looked as out of breath as I still did – ah well. When everyone had finished the results were read out (thankfully not in ascending order). Hopefully we will be doing it again so I can use it to measure my progress. I ran home in the snow at a more comfortable pace. Yes, ok, it was a slower pace. So what?! Ha ha. It was comfortable and I very much like comfortable. I like to be able to breath and not have a close up with death when I’m running. Comfortable is where I’m happy. I know the next beep test won’t be comfortable but I will increase my level!